A bit more in my comfort zone this week with the e-course PaperLove's theme of 'book'. 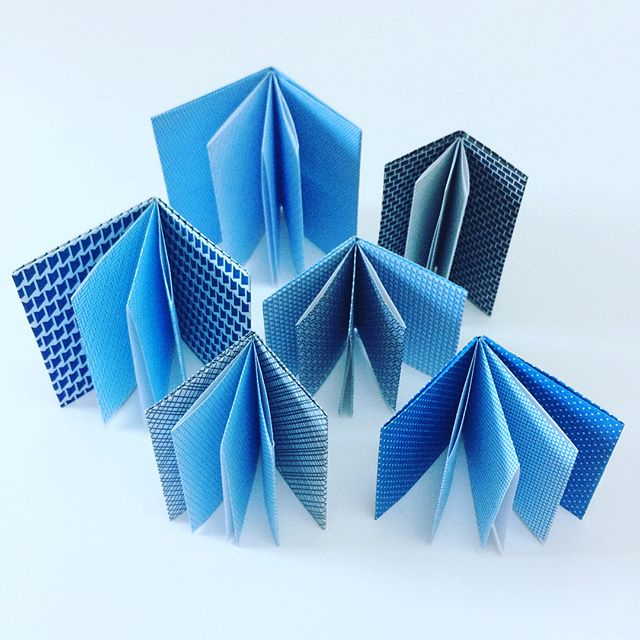 Starting with making single sheet 'trouser books' from envelope patterned papers (combined with last week's folded cover to make them more robust). Quite addictive once you get folding. Then moving onto a mobile of tiny map books (photographed on a particularly gloomy day)… not totally happy with the end result of this one so I may re-visit it at a later date. I like the idea, just not my execution. The larger project this week was making a multi-section book. I'd done this before so I wanted to use it as an opportunity to try a few new techniques: using deckle edged paper (cut with a clip point knife), embroidering bookcloth, leaving longer knot ties on the outside of the book, and also bringing the stitching over the top and bottom of the spine. Really pleased with how this one turned out, and I'm using it as a sketchbook already - hurray!